Currently, all my configuration is enginered to be controlled from the internet. The configuration of the Interface Manager uses my public IP address with the ports that I configured in the port forwarding section of my router. And from the Internet (outside my home),I would like the IP adresses of my equipments are changed to my public IP (as currently). I managed to make a first step with a button in an Activity that changes the value of some variables that are declared in the IP Address field of the Interface Manager. But I need your help to know how to detect that I am on my local network or outside to automatically ( whithout a button to do this) change the IP in the Interfaces Manager. Maybe a "what is my IP" to compare it whith my fixed public IP address but I do not see an easy way to do that in a script. Do you see another way to do it and if so how? 1) When creating the interface host entry in Interface Manager, specify a WAN port that matches the port you use in the port forwarding in your router for that device. It can be the same as or different from the normal LAN port. 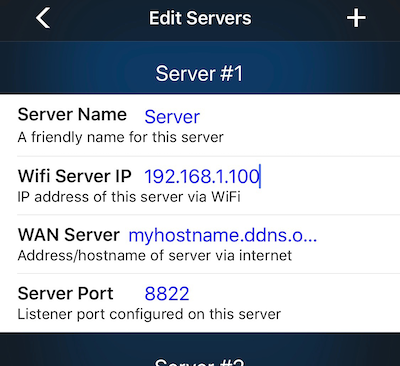 2) When adding the server entry in Network Settings in TouchControl on your device (or when editing a server entry that was automatically added via Zero Config Networking), just add the hostname or IP address used by your dynamic DNS service in the "WAN Server" field for the desired server. Then, whenever TouchControl detects that it is not on WiFi, it will automatically use the WAN Server address/hostname for all connections, and it will use the WAN port specified for each interface host. Also, if you are outside your network, but are still on Wifi (such as a public WiFi connection at a hotel or coffee shop), just turn on the "Force WAN" option in Network Settings in TC on your device, and even though it detects that it is on WiFi, it will still use the WAN connection settings. - If it could, the app use the local ip addresses inputed of the Interface Manager. - If not, the app use the hostname or IP public adress inputed in the server settings fiels of the device. I understand better why I did not succeed until now: my TC server in on a Laptop always whith me. Then, i just have to install a TC server at home. Do i have to let him open ? or is it a service? If the app detects that it’s on WiFi it will try to reach the server at startup, but no, the server does not have to be running at all to use the app. If the app fails to find the server it will not affect the use of the app at all. Whether the app uses the LAN or WAN addresses is not dependent on whether or not it finds the server, it is only dependent on whether it detects a WiFi connection on the device or not. Hope that makes sense. Yes, it makes sense for me. It just detect if the device has a wifi connexion and if not, it use the IP public adress inputed in the server settings fiels of the device. "In the street": IP public adress inputed in the server settings fiels of the device. Still just an issue: my conf is tune to open on a default activity. When i change the "Force Wan" option, i had to restart the app because after change this, it reload the profile but stay blank (just the TC background) and don't reload the default activity. Is it possible you modify the app in the next release to correct this issue?